Svalbard reindeer (bull). Blomstrandhalvøya, mid September. 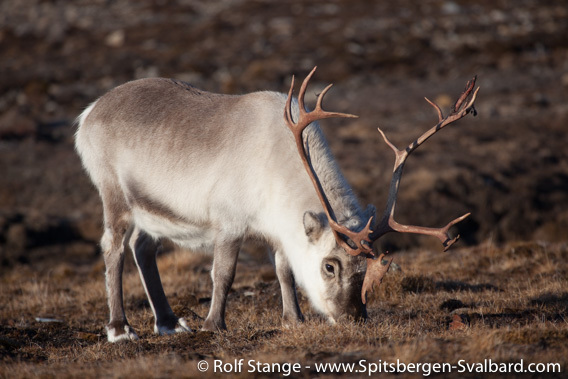 Description: The Svalbard reindeer (or Spitsbergen reindeer) is the only reindeer species in Svalbard. It is a unique, relatively small subspecies. Both sexes have antlers, but those of the males are bigger. Male reindeer grow their antlers from April to July, shed the bast in August and September and finally the antlers in late autumn, after the breeding season. Females get their antlers in June and carry them until spring next year. Females: Weight 53 kg in spring, 70 kg in autumn. Length 1.50 metres. Males: Weight 65 kg in spring, 90 kg in autumn. Length 1.60 metres. 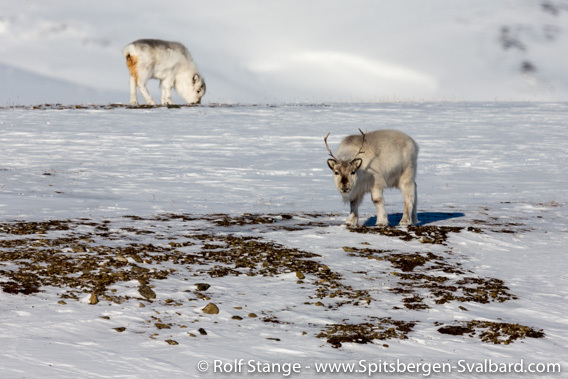 Svalbard reindeer: cow and calf. Alkhornet, early August. 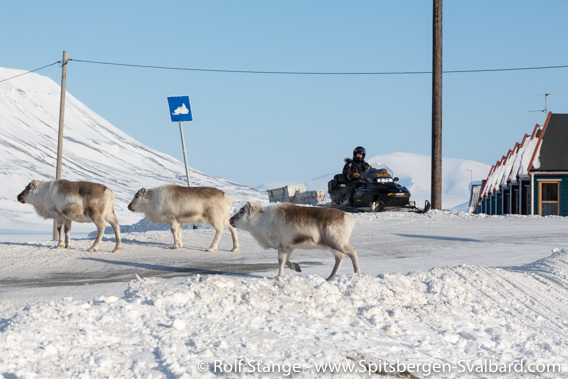 In contrast to Scandinavia where semi-wild reindeer stay together in large herds, you will see either single animals or small groups in Svalbard. Herds of more than 20 animals are exceptional. Svalbard reindeer are not domesticated and do not belong to anybody. Svalbard reindeer: strong male. Hornsund, late August. Distribution / Migration: Reindeer occur everywhere in the Arctic, but the subspecies “Svalbard reindeer” is endemic to Svalbard. They were driven near to extinction in the early 20th century due to extensive hunting, but have recovered well and can now be found in most parts of the archipelago, although man has helped on some occasions by moving small stocks within Spitsbergen to suitable areas. 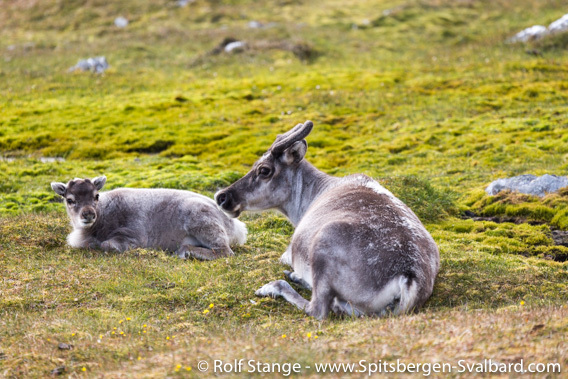 There are even some reindeer chewing on the very meagre vegetation in the polar deserts on Nordaustland, but they do not occur on the remotest islands of Storøya, Kvitøya, Hopen and Bjørnøya. Highest population densities occur in areas with rich tundra vegetation, mainly Nordenskiöld Land and the large islands of Edgeøya and Barentsøya. Within these areas, they do not show a very pronounced seasonal migration pattern, as winter and summer feeding grounds are within the same regions. Reindeer walk across fjord ice and glaciers to move around. During the late spring in 2011, about 1000 reindeer were counted in Adventdalen, which gives an average density of about 6 animals per square kilometre, three times more than in Finnmark (north Norway). Continuous counting started in 1979 in this area, and the average from the beginning to 1995 was 650 animals. The recent increase is explained with the changing climate by the the responsible biologist, Nicholas Tyler. Svalbard reindeer on barren winter tundra. Sassendalen, mid April. Biology: Svalbard reindeer will eat almost anything that has roots and leaves, with a few exceptions such as Arctic bell-heather (Cassiope tetragona). During the summer, they spend most of the time feeding to accumulate a thick layer of fat, which is their main energy source for the winter when food availability is low. Reindeer spend the winter in places where the snow has been blown away by the wind, to have access to some vegetation, often at some altitude. Late winter and spring are the most difficult time of the year, when the tundra is still hidden under snow and their fat reserves are used up. Especially when periods of thaw are followed by frost and everything is covered with an impenetrable layer of hard ice, reindeer are faced with difficult times. Starvation during such periods and when the teeth are worn down after about ten years are the main causes of death. Few reindeer die during the rich summer season. Mating is in October. During this time, strong bulls will defend a harem of up to ten cows. During the following early summer, around June, a single calf will be born. The proportion of females that give birth varies strongly from ten percent in difficult years up to 90 percent in good times. There are accordingly very pronounced fluctuations of the population size. Miscellaneous: The size of the total population is estimated to be around 10,000 animals, thereof about 4,000 in Nordenskiöld Land, but varies from year to year. Reindeer have been protected in Svalbard since 1925, but limited hunting has been introduced for locals in 1983 in designated areas in Nordenskiöld Land. The hunting season is in September and it is assumed that hunting does not affect the population. 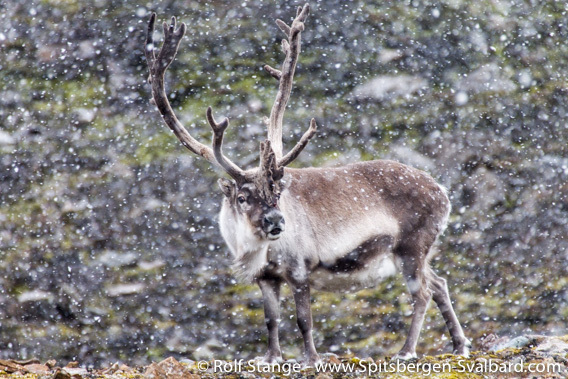 In 2006, 296 permits were issued, but only 178 reindeer were shot. 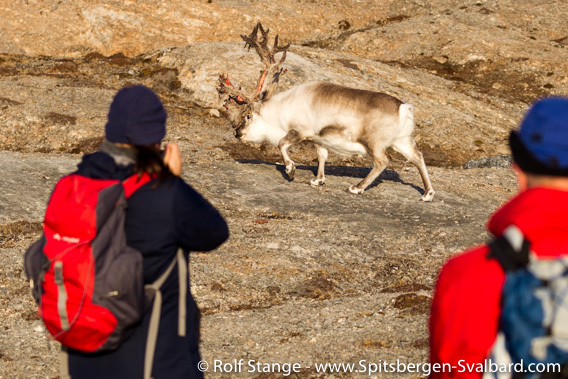 Tourists and reindeer in Kongsfjord. Despite hunting, reindeer can be very curious and sometimes approach groups of tourists to a distance of within ten metres. They spend most of the day walking slowly over the tundra, feeding permanently, and do not pay any attention to humans to begin with. Then, they are typically undecided between running away and coming closer. Snow mobiles can pose serious strain on reindeer during the most difficult season, when they need to save energy. Pay attention to this and give reindeer the right of way. During the summer, you will often find reindeer hair on the tundra. Wishful thinking suggests that this is Polar bear fur, but the distinction is easy: Reindeer fur is much coarser, but breaks easily, whereas the finer Polar bear hairs are much thinner and stronger. Reindeer in Longyearbyen, mid April.